The other day I looked in my fridge and found a dozen eggs, pushed to the back and forgotten. They were well past their sell-by date–good for hard-boiling, and little else. I’m leaving town for two weeks, and these eggs needed to get eaten. 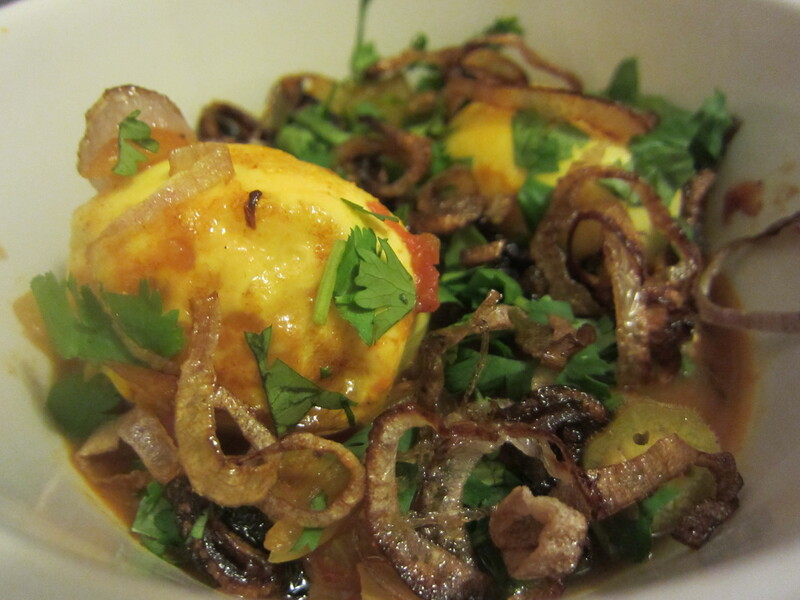 Enter a recipe I’ve had bookmarked for a good long time: Burmese egg curry. As the name implies, this is a curry built not on meat, but on hard-boiled eggs. It’s an odd combination, but a nice one, with the eggs providing a rich, chewy contrast to the sauce. And what a lovely sauce it is: clean-flavored, fresh, spicy, light. The primary flavoring agent is turmeric, which I usually rely on more for its pungent yellow color than as a spice in its own right. But as the backbone of this curry, it’s gorgeously subtle: nutty and earthy and just a little bit sweet. Even beyond the spice base, though, this curry is deeply satisfying. The standout vegetable here is okra, cooked just until crisp-tender; it thickens the curry slightly, making it soft and glossy, while keeping the bright greeny flavor to a maximum and sliminess to a minimum. And the whole thing gets finished with a scattering of cilantro and a big handful of crisp-fried shallot rings–deeply caramelized and sweet, nicely offsetting the spicy bite of the curry and the richness of the eggs. For such a surprising and exotic dish, this is a great pantry cleanout. Most of the ingredient list is pantry staples–eggs, onion, garlic, canned tomato products, spices. I keep fish sauce around, because I love the salty funk of it, but plain old standby soy sauce works just fine. I also had a knob of ginger hanging around from another dinner, and it turns out this is a great use-up. All I had to buy were cilantro, shallots, okra, and a chili or two. In 45 minutes, I had dinner for three nights in a row–I fried as many shallots and eggs as I wanted each night, ladled on some warm curry, and tore a few cilantro leaves over the top. Easy, delicious, and just odd enough to be special.